As much as we would like to sell you one of our own mopeds, you don’t have to purchase one from us to get our advice. Whether you just need to find out what spark plug or transmission lubricant your bike needs, or you want to know our opinion on a particular moped that’s up for auction on Ebay or for sale on Craigslist, feel free to contact us and we will try to help in any way we can. How much should you pay for a used moped? Mopeds values are worth whatever the market has determined them to be worth and not a penny more or a penny less. The only thing that is absolutely certain about moped values is that the market value is different depending on what region they are being purchased or sold in. You will find that in large metropolitan areas like San Francisco or New York, the value of a vintage moped could easily be double in comparison to smaller Midwest cities like Kansas City, Des Moines or Minneapolis for the exact same bike. Average higher incomes, higher demand and fewer surviving mopeds available in coastal cities all certainly play a major part in placing a value on a moped. In Midwestern and northern US states, mopeds were put away in garages, sheds and barns as soon as the first sign of winter appeared and remained there for 6 months. In areas along the southern Pacific and Atlantic coasts, mopeds tended to be ridden much longer during the year and spent much more time in the salty air resulting in less quality preserved machines. Rarity of certain models in certain regions of the US also plays into determining values and can offset regional price differences. A desirable, clean and original Derbi Laguna moped could bring upwards of $2000.00 in San Francisco where many were originally sold but few survived. Very few ever made it into Midwestern dealerships so that same moped in Milwaukee could still garner that $2000.00 even though that city traditionally sees lower values. Different regulations and laws that each state sets also helps determines value as well. A non-titled moped in Iowa is worth far less than an untitled moped in a state that doesn’t require titles like South Dakota. So, do some research and watch the ads in your area. We can’t possibly tell you what every moped’s value is in every state and neither could anyone else. The following is just an educated opinion and is based solely on our own experiences in the Upper Midwest region of the United States and includes North and South Dakota, Iowa, Nebraska, Minnesota, Illinois, Wisconsin and Michigan. Here are just a few things that in my opinion that you should consider when purchasing your 1st moped. Study and Research about vintage mopeds all that you can. They are not for everybody. You need to fully understand that riding, owning and maintaining a vintage 2 stroke moped is not the same as riding or owning a modern 4 stroke scooter. Watch Craigslist and be prepared to buy immediately. The best moped deals are gone within hours or even minutes so you will have to be ready to scoop it up or someone else will. Don’t get attached to a moped before you purchase it. You will pay too much. Be prepared but be patient. There will always be mopeds for sale. Don’t feel that if you don’t buy a certain moped that there will never be another one for sale. Contact a local riding group. They know where a lot of the mopeds that are available are or who not to purchase from. Don’t buy a non-running moped. You have no idea what it will cost to repair. Avoid moped “flippers.” These are people who buy a moped off of Craigslist and turn around the next day and re-list it for more money. It doesn’t mean that it couldn’t be a great deal but the person selling it has no real connection to it and knows nothing of its history other than what they were told. They are just looking to make a quick buck. Don’t buy a moped off Ebay. You need to be able to see, feel and ride it first. Pictures can be very deceiving. A good used running and tuned moped that is complete and in original and unmodified condition shouldn’t cost more than $650.00 if the tires are good. If the tires are original and need to be replaced, subtract $100.00. If the engine needs a tune up, subtract another $100.00. A great 1st moped would be a Puch Maxi with single speed E50 engine, Honda PA50II Hobbit, any Piaggio/Vespa moped, any Italian moped with a Minarelli V1 engine or any moped with a Sachs engine. Repair and performance parts are readily available for all of these. Mopeds to avoid for 1st timers are anything with a 2 speed automatic engine including Puch, Kreidler and Tomos mopeds. Other more high maintenance machines like Motobecane 40 and 50V’s, Batavus Regencies and Peugeot mopeds should also be avoided. These are all excellent machines but probably not the best for first-timers. These would be highly recommended as your second or third moped. You will eventually own around 9 of them on average! Don’t buy a rear engine AMF moped, period. 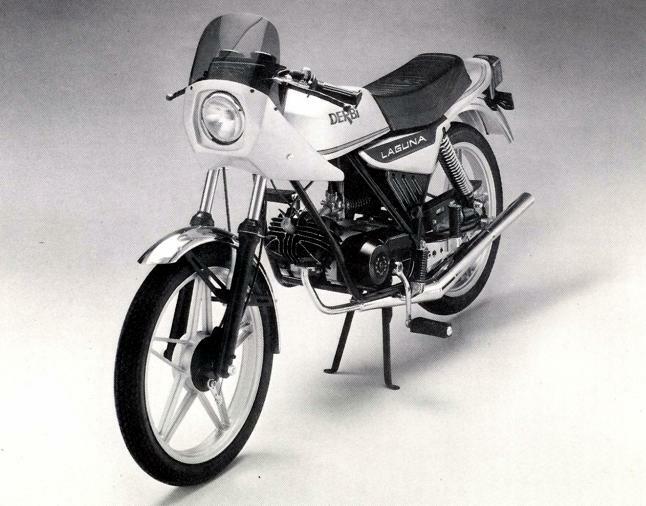 Avoid Japanese no-peds like Honda Expresses, Yamaha QT50′s and Suzuki FA50′s. These are the small bikes that are the predecessor to the current scooters and have footpegs for your feet and no pedals. They are technologically advanced and great bikes but have too complicated of electrical systems for the average person to repair themselves. And besides, real mopeds have pedals! Be prepared to travel an hour or so if you can to buy a good moped. It will be worth it many times over in the long run. Use a small flashlight to inspect inside the fuel tank for rust. Twist the throttle and squeeze the brake levers. Everything should be free and work. Pedal the moped or spin the wheels with your hand. Wheels should not have any wobble to them. Inspect the exhaust and make sure it is not rusted through anywhere. Look for gas leaks at the carb or shut-off valve (petcock). Ride the moped and squeeze the brakes. It should stop without squealing. If you hear loud squealing, the brake pads have become too hard over time and will need to be replaced or conditioned. Have the seller demonstrate that the headlight, brake light and tail light all work. If the bulbs are burned out there is a reason for it. More often than not the generator system (magneto) is putting out too much voltage and replacing the bulbs won’t cure it, they will just keep blowing. Magnetos can be expensive to repair by an hourly rate shop. Inspect the tires. Mopeds that have original tires from the 70′s or early 80′s need to have new ones installed without exception. It is a safety thing. Inspect the title. Don’t take the sellers word for it that it has a clear and transferable title. If it was filled out in someone’s name or has mistakes on it that were changed or crossed out, you could have a very difficult time ever registering it. A lot of mopeds being sold don’t have a title for various reasons. Make sure you know the laws in your state regarding mopeds, titles and obtaining new ones. A few other things you may want to consider and study up on before buying a moped. Some French manufactures like Peugeot and Motobecane mainly built and sold their own Mopeds under their own name with very little re-branding. Highest quality of all bikes but also require the most maintenance expense. Other European manufacturers like Vespa/Piaggio, Batavus, Derbi, Kreidler, Tomos, and Garelli built and sold bikes under their own name. Most Puch mopeds were sold under their own name with their own engines but they also licensed and allowed major retailers like J.C. Penney (Pinto)and Sears (Freespirit) along with bicycle company Murray to sell their own versions but with different frame modifications and other parts. Though these bikes look different, almost all the parts were the same ones that were used in the Puch models and are interchangeable. These are all excellent all around good bikes for the value. Many Italian mopeds were just heavily re-branded with many, many different names for essentially the same bike. Manufacturers basically purchased frames, engines, wheels and controls and assembled them with only subtle differences like paint and decals. Most Italian mopeds came with either a Morini or Minarelli single speed engine and also used one of about 6 frame designs. Don’t get too caught up in the name of the moped because it has very little to do with the value or performance.